Some of my ‘signature’ style cutting boards… unless someone says otherwise. LOL. Nothing new under the sun. These are end grain up. One is Maple and Purpleheart. The other is Walnut, Maple, Purpleheart and a small amount of barely distinguishable (from maple) Hickory. I end grain cutting boards. An old love of mine. Made 20 in row. Had a great run .. yours look a lot like mine. Maple and Purple Heart are nice combos. Like your designers. They take a lot of planning and a lot of glue.. Check out mine in my projects. They look similar. Phil – great work. I really like the designs you have done. Might have to try some of those. Very Nice Work & Well Done Phil! 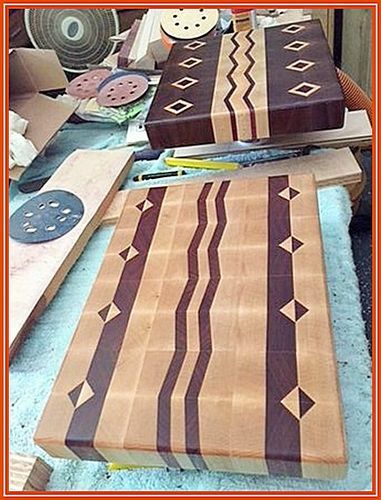 These are wonderful cutting boards and the wood and patterns are beautiful. They are fine eye catchers. Thanks, Ivan and Charles… .and hey, I like the woodworking expo website. Cool info. Love your work… seriously good looking boards. These are a beautifully designed and built. Well done!